I love chewy breads. Breads with fight. Breads that DON’T fall apart when you bite into them. If that is the type of bread you like, then THIS bread is for you. I made 1/2 of the total recipe. 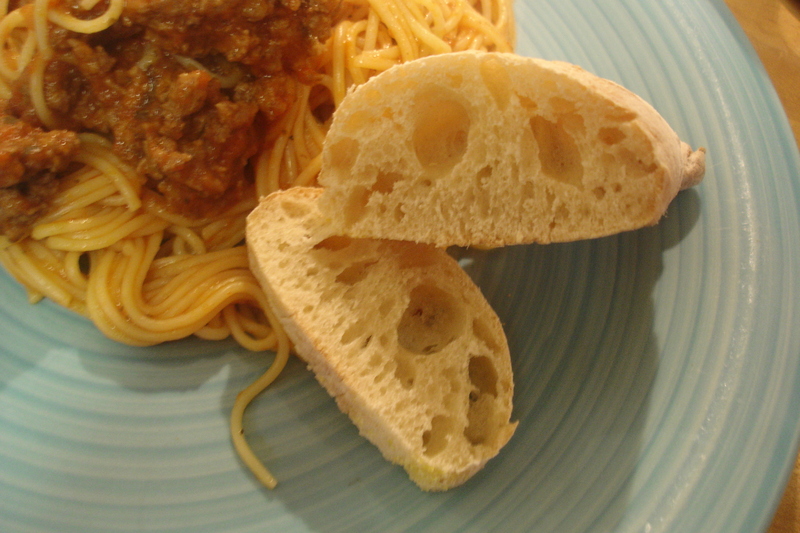 Then from that I made ONE loaf of bread which was good with our speghetti, or just plain, warm from the oven. Chewy!! 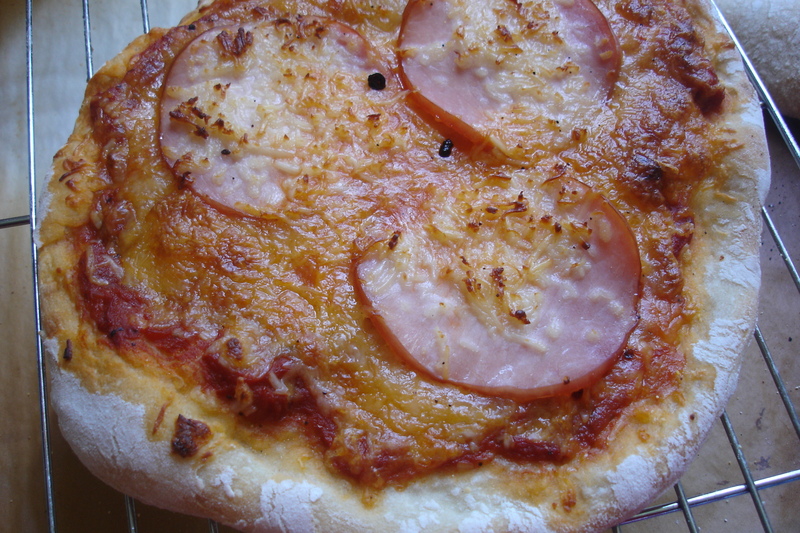 …which he said was the best home made pizza I have made. And one pizza dough baked with out toppings for later. This is one of the easiest and tasty breads we have made so far with the Slow And Steady BBA Group. Othere members of the Slow and Steady group have made or will make this bread, so visit them as well. Kayte, Nancy, Cathy, Audrey, Jessica, Melissa, Sarah, Di, Karen, Natalia, Tracey, and Leslie. Oh, you got such nice holes in your bread! This looks so good, both as bread and as a pizza. I want that pizza that The Boy had! Yum! Your Pain a l’Ancienne looks absolutely perfect! Just like the ones I used to buy when I lived in France!! Look at those gorgeous holes in your bread!! Great job. I really want to make this one so I can use it for pizza – I just need to grab the book from the library. Whoa Margaret!!!! Those holes are AMAZING! Those are the holes I wanted to get in my ciabatta. I need to try this one – if I can get holes even half that size I’ll be thrilled. Good job, you! Looks good, Margaret! 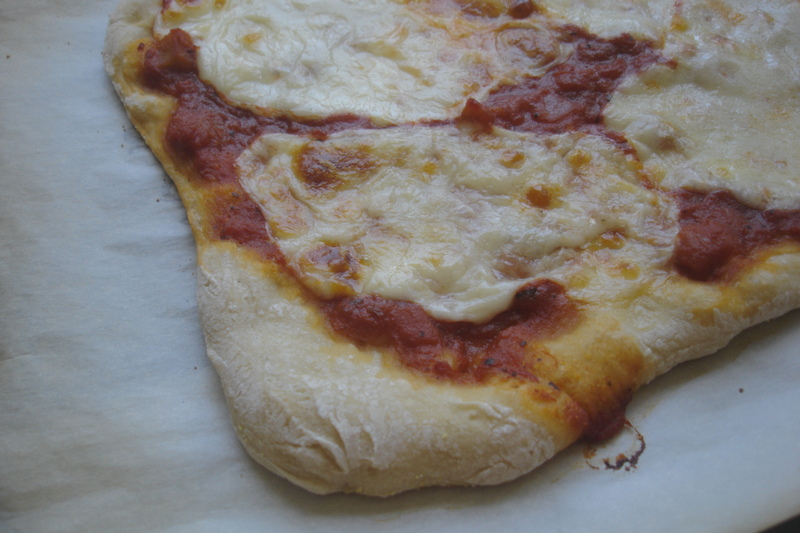 I’ll have to try this one again as pizza, though I’m happy with other Reinhart pizza dough I make. Nice holes! You rock! I am so impressed with your holes! I must make this one soon if for no other reason than those yummy pizzas.